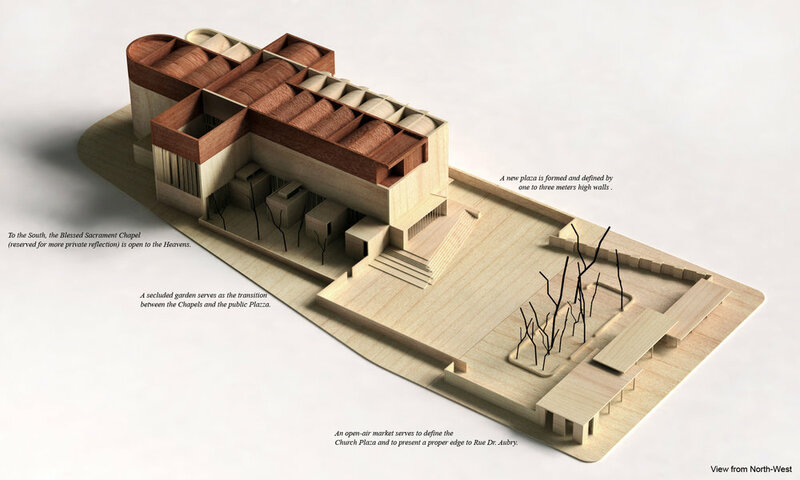 The competition brief called for the redesign of the Notre Dame de l’Assomption – Haiti's National Cathedral which was destroyed during the 2010 Earthquake. The design of a place of worship introduces the challenge of how to inspire religious feelings appropriate for the reverence of a supreme being. Our proposal attempts to achieve a tranquil space for meditation by illuminating the vast mass of architecture with an incomprehensible mysterious light. The architecture is presented as an absolute plain wall of concrete which expresses the true character of the construction. Lifted above the new concrete nave a ghosted cross - clad in salvaged stone - is raised up to the heavens, representing the remains of the existing church. The concrete material is not only structurally appropriate it also produces a somber cool space that absorbs light - forming an architecture of shadows. Light enters the nave at the level of the pews connecting that worshiper to the earth. These are open-air voids with operable wood louvers allowing for natural cross ventilation. A mystifying light enters from above along the south wall casting a glow onto the mass of the vaulted ceiling. The north transept acts as the Blessed Sacrament chapel open to the sky with a full louvered wall illuminating the crossing of the nave. 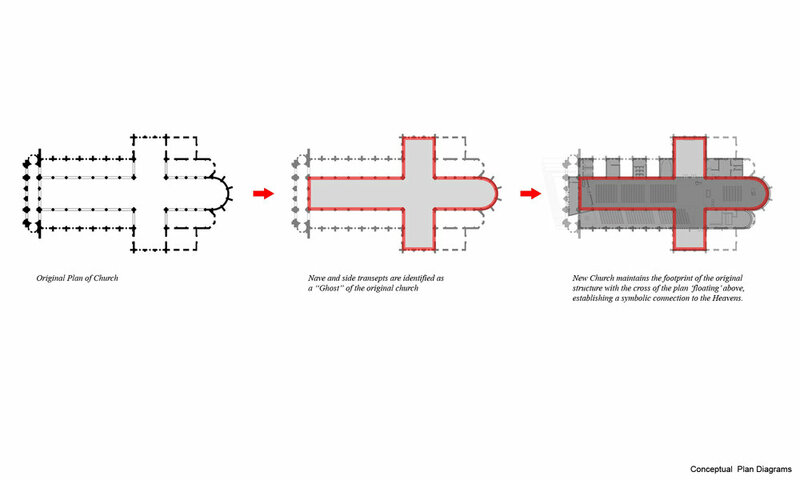 The light effect culminates as a void sliver is caught between two curved masses casting a divine light onto the altar.